Ok now that I have your attention (! ), I am going to write a bit about my first experience at the international, annual Agile conference. 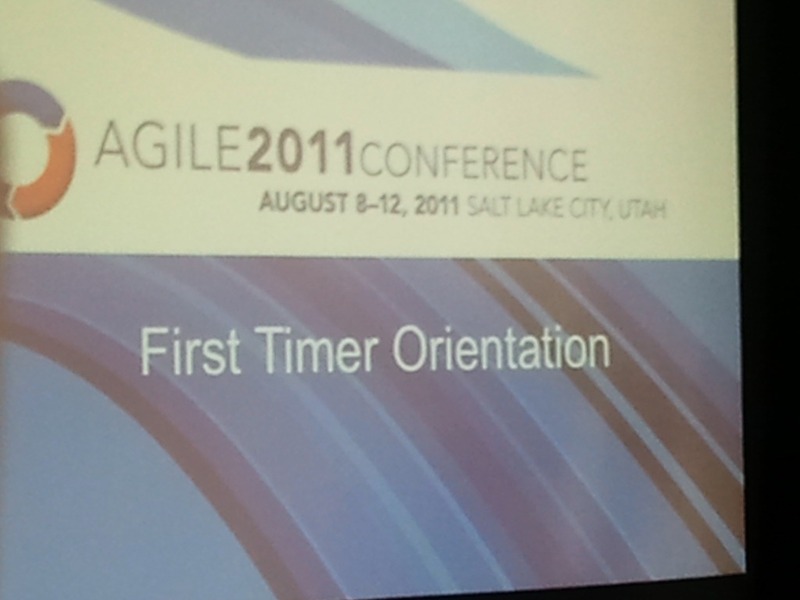 Agile 2011 was held in Salt Lake City, Utah last week. I attended and spoke (on ‘Teaching Kids to Program Using Agile Practices’) and had a GREAT time. This conference had 1600 people, from all over the world. This year was the largest attendance at the annual conference on record. Attending and speaking at conferences is a large part of my job. 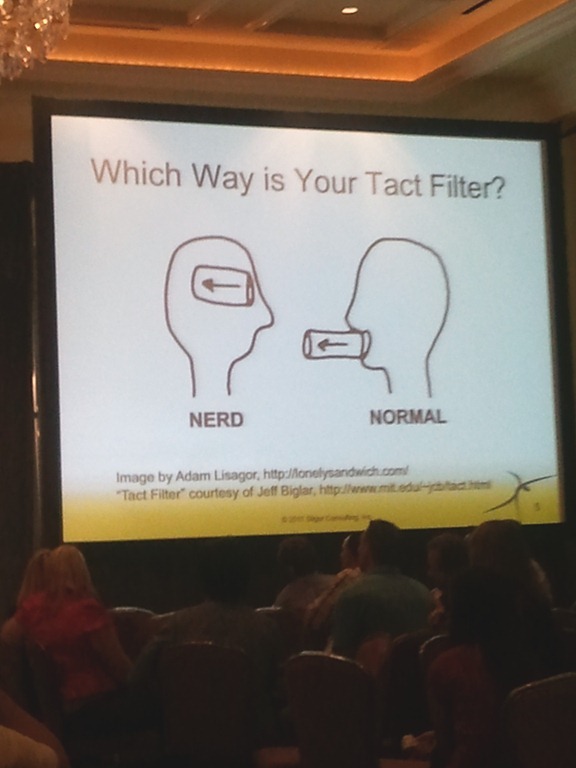 On average 1 speak at one or more technical conferences PER WEEK, so around 50-100 PER YEAR. I have been doing this for around 5 years now. So, you can do the math on how many conference I’ve been a part of since I started working as an evangelist. Prior to attending the Agile conference, the best gender-balanced ratio I’d ever experienced at a technical conference was at the annual US SQLPass summit. However I am estimating that was around 25% women. 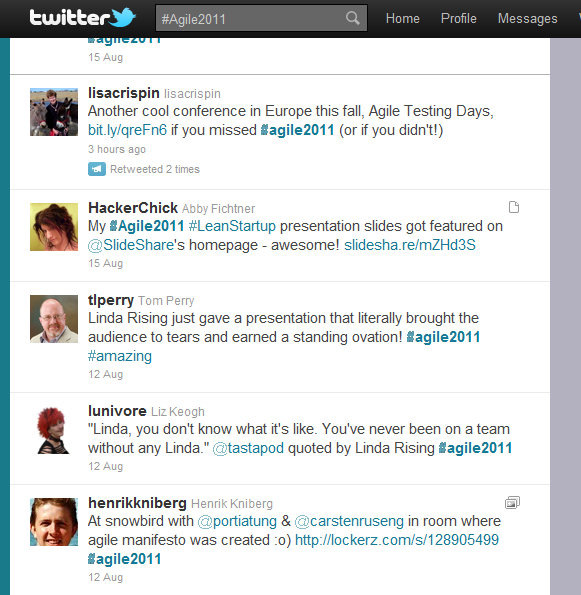 Agile 2011 was striking for not only the number of women attendees (nearly 50%), but also the number of women speakers. There were also both open and closing keynotes delivered by women too. As a technical women, what is the effect on me and the other women attending? I was struck by one feeling – comfort and the desire to participate. I noticed over and over that I was not the only one — women participated more frequently during sessions, led scheduled sessions and even ran some their own sessions on an ad-hoc basis. So, how was this achieved? What did this conference ‘look like’? As you may have guessed, it didn’t look like any other technical conference I’d ever attended. 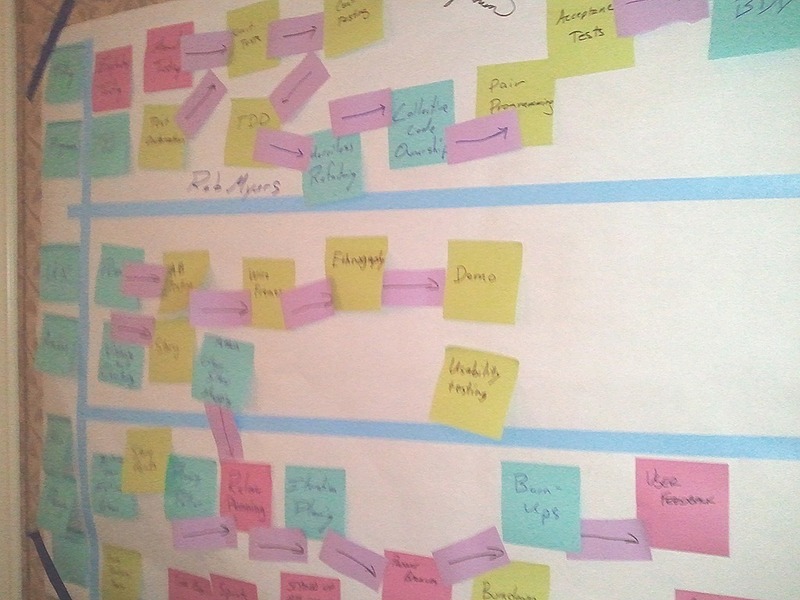 1) Multi-modal – instead of tracks, there were 20 stages, there were scheduled sessions of 5 minutes to 3 hours. These stages were based on people, i.e. roles and NOT on particular technologies or products. There was also an unConference preCon held openSpace style. Below is a graphic showing the different stages. 2) Flexible – there was ample time in the schedule and space at the conference for ad hoc sessions, the open Jam room was large comfortable and conveniently open for the entire conference. Below is a sample of how a spontaneous talk was ‘advertised’ on Twitter. Note the format was ‘PechaKucha’(20 slides, 20 seconds per slide, auto-advance, 5 minute limit). There were also white boards outside the #openJam area post, solicit interest and to advertise ad hoc talks and sessions. Formal sessions often ‘continued’ in the Open Jam space after the original allotted time had passed..
3) Creative – there were whiteboards, post-it notes, actual toys (Jenga, LEGO bricks board games, etc…) everywhere. Attendees drew various thoughts and projects on large, shared art spaces. As a LEGO Serious Play trained facilitator myself, I was happy to pair-lead a session showing how LSP works with another facilitator (and Agile coach) from Toronto. 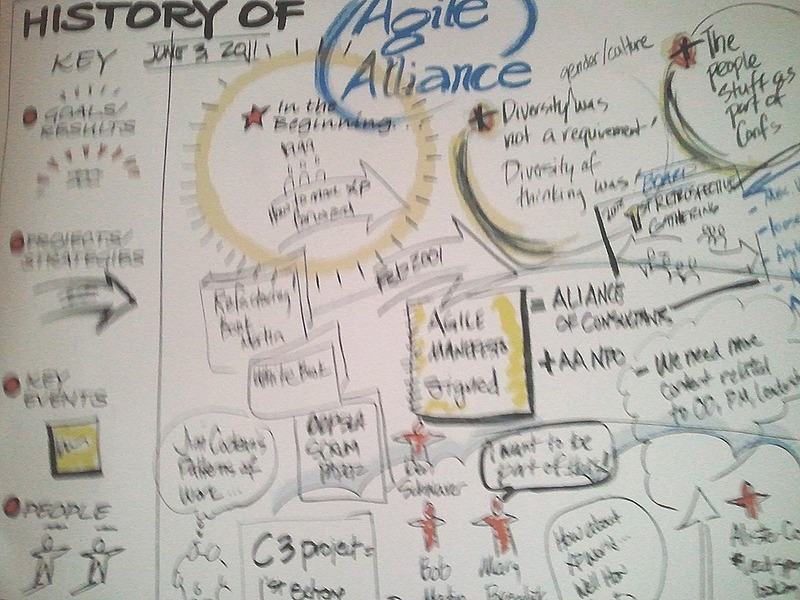 People were drawing, writing and scribbling all over the place – a neat history of the Agile Alliance evolved the Open Jam room during the conference (shown below). Of course there were post-it notes EVERYWHERE too! 4) Fun – Magicians, Trampoline artists, Parkour performers and a rock band all entertained us at various times. Also many of the sessions included both theory and one or more hands-on activities. These activities at the least got everyone up and moving around the room. Sometimes the hands-on activities involved coding too. The workshop we presented (on TKP), included both of these elements – deck here – and was very well received by our attending group. The slide below cracked me up and is from a session I attended on communication (most of the session was conducted via games or activities in small groups). By the way, I’ll decline to answer the question posed in the slide for now too! 5) Human-centered, social and international– there were large screens with twitter feeds with the #Agile2011 hashtag all over the conference venue. Attendees used twitter to communicate about what they were seeing, learning and who they wanted to meet with. Below is a small sample from the tweet stream. 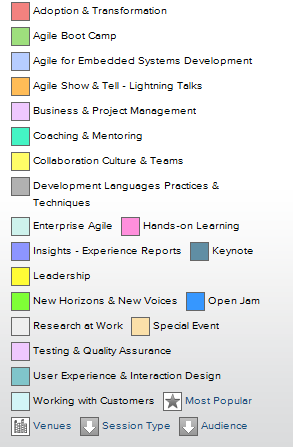 Also there was not only one, but two special sessions to welcome and to orientate new attendees to Agile. These sessions were well attended (more than 400 people in the first one) and really helped first-time attendees to feel comfortable. Many questions were asked during these presentations. All questions were answered patiently and respectfully. Another type of session that was interesting was ‘Coaches Corner’. Note again the multi-modal formats that attendees could use (shown below). It was interesting to see that every time I stopped by the Open Jam area someone was in the Coaches Corner. Another ‘session’ showing inclusivity for those newly attending (or attending on their own) was ‘dinner with a stranger’. Implementation was simple – just set up 4 white boards (sign ups) with restaurant names and let people sign up. It was neat to see how many people took advantage of this opportunity to meet someone new. 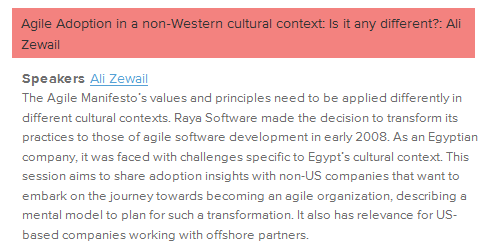 One of my favorite sessions was on understanding the implementation of Agile practices on non-Western cultures. The abstract is shown below. 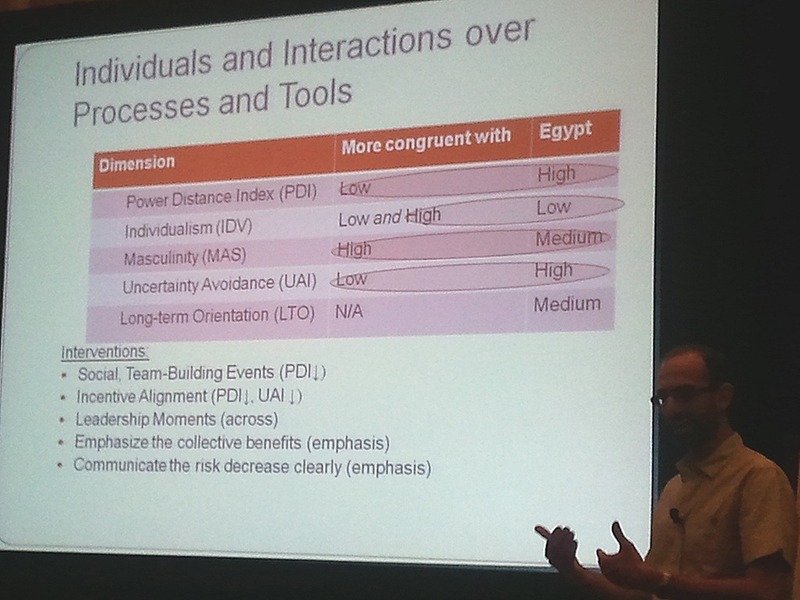 In this session, Ali Zewail from Egypt led a fascinating discussion comparing cultural traits with Agile tenants. He also included his own practical experience adjusting his implementation for his team in Egypt. 6) Respectful of experience – celebrating the 10 year anniversary of the Agile manifesto, 15/17 of the original authors of the Manifesto attended, spoke and were accessible for side conversations (easily identified by the shirts they wore). Further support of people with experience was that one keynote speaker (Linda Rising) was 70 years old. 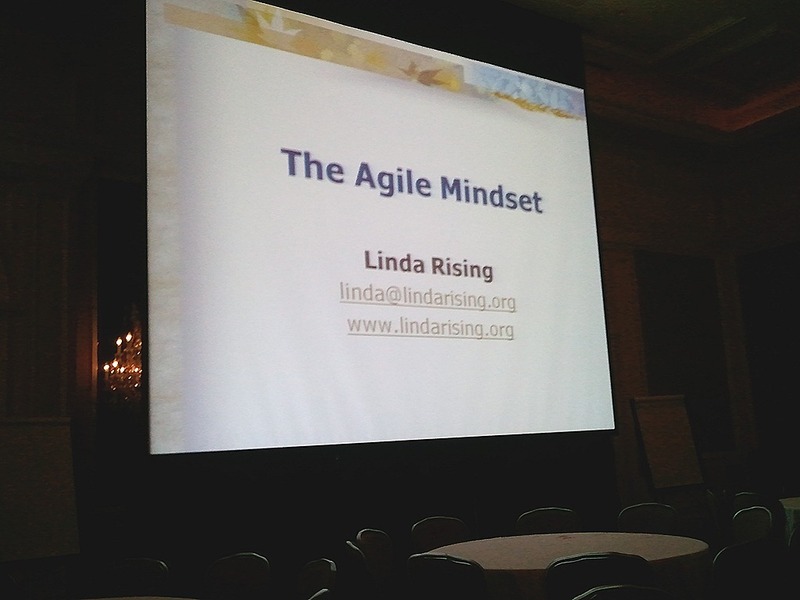 Linda Rising’s closing keynote captured the audience and was one of the highlights of the entire conference for me. 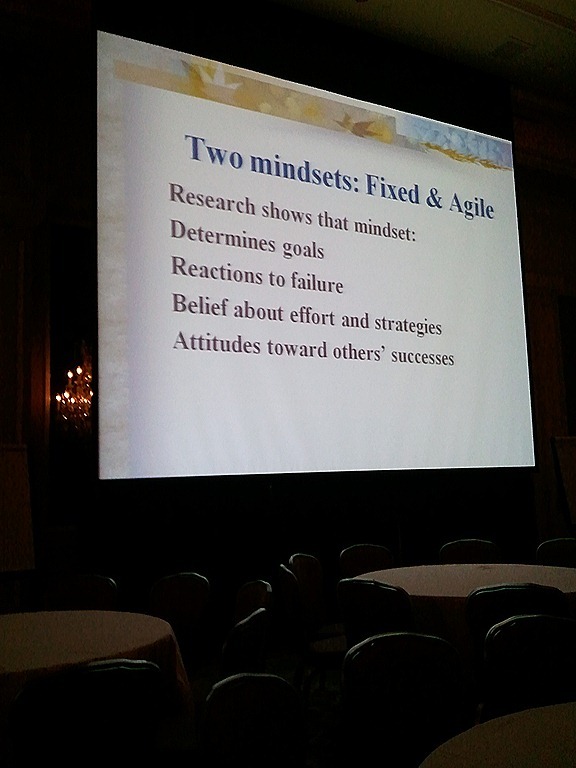 Linda’s talk about the scientifically-based differences between the Fixed and Agile mindsets (shown in the slide below) are literally going to get me to make some major changes in my life. After her talk is posted on-line, I’ll add a link to it here. 8) Technical – of course we also built things, using Agile techniques during the conference. Below is a tweet from Llewellyn thanking his pair programming buddies for helping him to code up a new version of the Virtual Proctor for our TKP courseware. This version stores screenshots from the kids on the web (i.e. a configurable http:// endpoint), rather than in a local shared folder. Llewellyn built this to overcome the (shared folder) port blocking we’ve often encountered at conferences and at schools. Also there were sessions like ‘How Functional Programming affects Agile Programmers’ and more. Most often code examples were shown in Ruby, Java or C# – sometimes other languages were shown as well. I chose to attend a number of sessions around the implementation of Test-Driven Development. There was quite a lot of (heated!) discussion in Bob Martin’s (@UncleBob) session on this same topic. 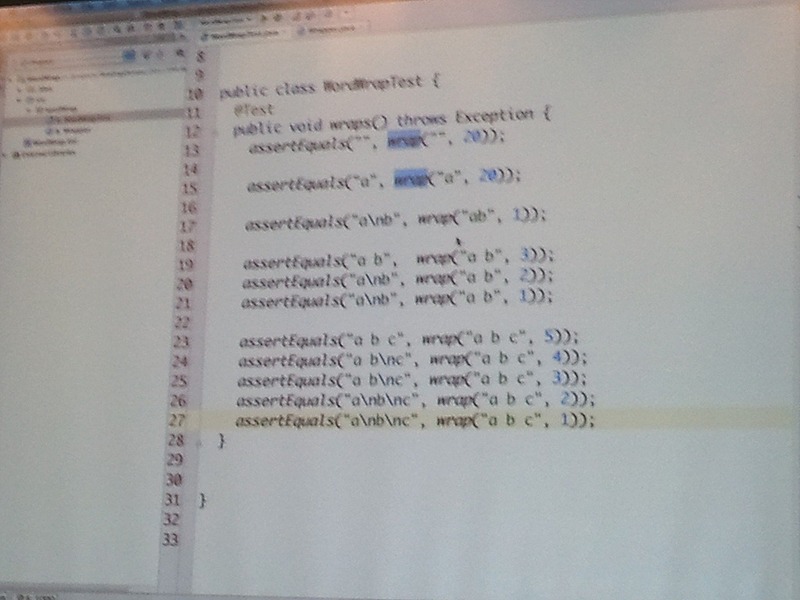 He started with the code shown below (Java), then asked attendees to pair up and code some more. It was interesting to see how easily and spontaneously the group did this – I heard ‘Want to code in Ruby? What about C#?’ etc…people were really just there to learn to code better. 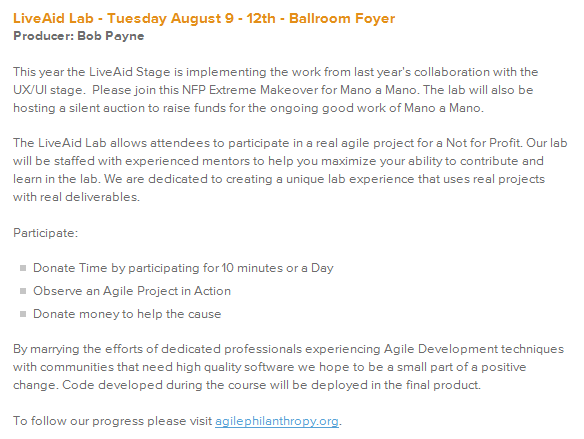 I was happy to see another hands-on type of session at the Live Aid labs. Detail is shown below. As many of my readers know, I am very big fan of getting hands on experience in new technical practices via contributions to non-profits. 9) Respectful of speakers – I felt especially privileged to have been a speaker at this conference. The submission process was arduous. This was the longest and most detailed submission that I HAVE EVER DONE for a single talk. Twice we added more detail and answered questions about the intent and content of our submissions in addition to having fully and completely written out our abstract. However after we were accepted, we were very well taken care of. Accepted speakers (up to 2 per session) get conference registration fee waived and the majority of the hotel stay covered. If you believe you have value to add to future Agile conference, I encourage you to apply to speak. 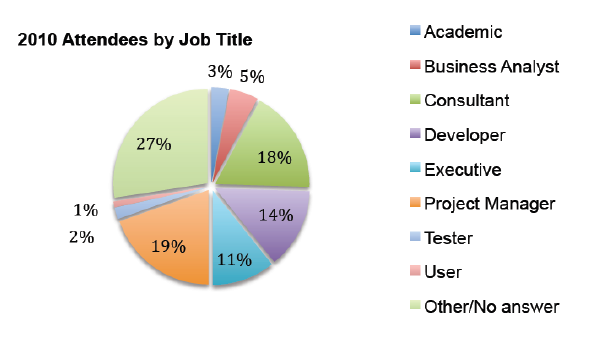 So, what kind of people attend Agile? Below is a breakout (from 2010). I’d like to see even more developers attend next year – what about you? 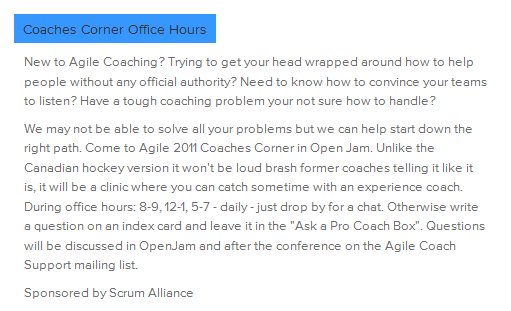 I had a fantastic time at Agile 2011 and would highly recommend attending and/or speaking there.